Editor’s Note: A previous version of this story incorrectly stated the relative size of Eris, another satellite in the solar system. Current estimates are that Eris has significantly more mass, but that it and Pluto have roughly the same radius.The story below has been revised to reflect the correct information. Clients who used this story are asked to run the correction that can be found here. Long sought by Flagstaff’s Lowell Observatory as Planet X, and classified as the solar system’s ninth planet in 1930, Pluto took a hit in 2006 when it was downgraded to the new category, upsetting Pluto’s defenders. “Dwarf people are people. Dwarf planets are planets,” said Fran Bagenal, a panelist and University of Colorado astrophysicist, when asked about Pluto’s current status. Panelists – NASA officials, academics and contractors overseeing the New Horizons mission – were unanimous in their support of the position that the littlest planet should still be called a planet, without qualifiers. Grinspoon, an astrophysicist with the nonprofit Planetary Science Institute in Tucson, moderated the panel that veered from the value of space exploration to the defense of Pluto to a discussion on Twitter with William Shatner – the actor who played Capt. Kirk in the original “Star Trek” TV series, who happens to be a science-fiction enthusiast. It was Shatner who prompted the Pluto discussion, with a tweet to NASA about its planetary status. Panelist Jeff Moore, a planetary scientist from NASA’s Space Science Division, obliged Shatner by asking, if Capt. 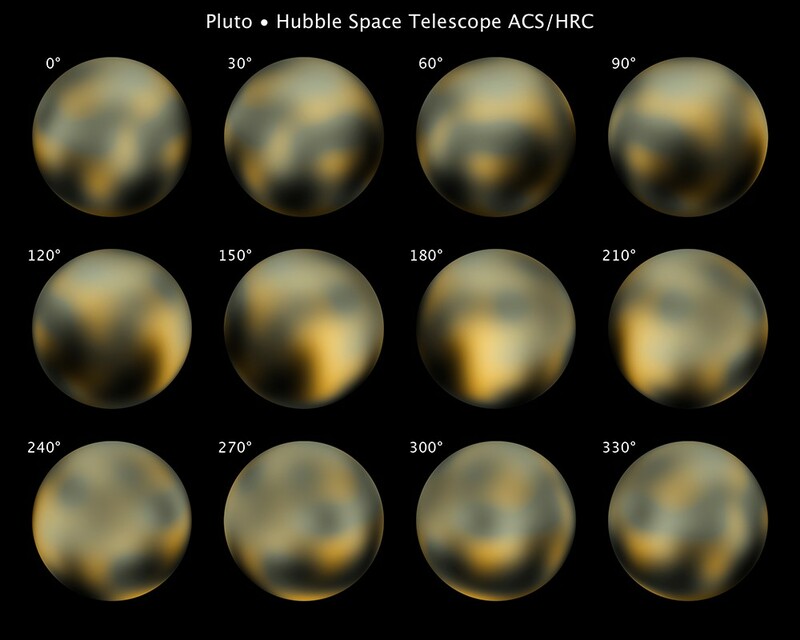 Kirk saw Pluto, would he tell Spock to land, or to keep flying? Pluto’s status was called in to question after the discovery of Eris, a satellite in the solar system that appears to be the same size as Pluto but is estimated to be much heavier. When Eris was classified as a dwarf planet by the International Astronomical Union in 2006, Pluto was also put in the minor leagues. 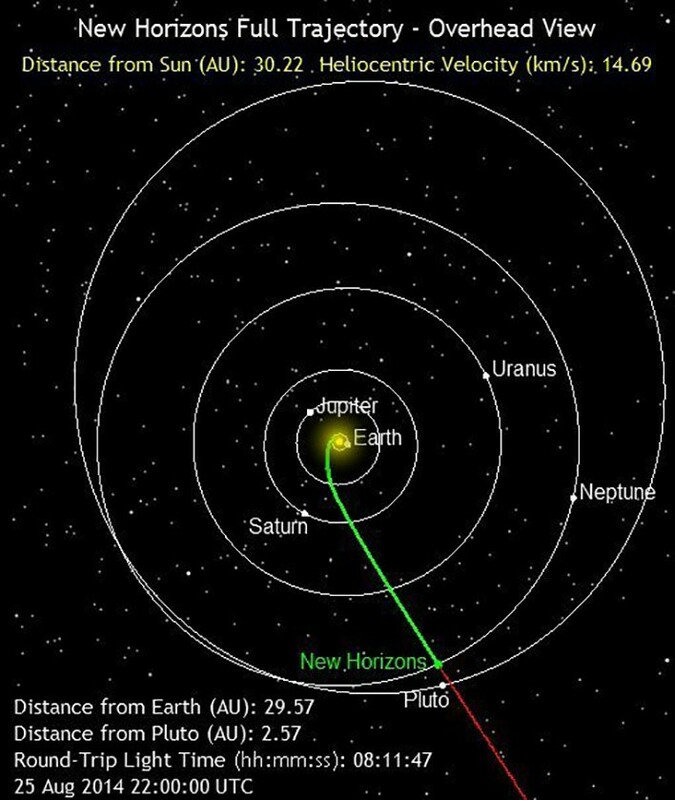 New Horizons was launched on Jan. 19, 2006 – seven months before Pluto would be reclassified as a dwarf planet. The probe, roughly the size of a piano, has since taken flyby pictures of any planets, moons or asteroids it has come across on its journey to the edge of our solar system. It reached Neptune on Monday, exactly 25 years after another space probe, Voyager 2, sent back the very first images of that planet, the eighth in the solar system. Voyager 2 continued past Pluto and got some images with its 0.64-megapixel camera, but New Horizons will travel four times closer with a 25-megapixel camera. New Horizons is expected to begin its flyby of Pluto on July 14, 2015, where officials like Grinspoon hope it will provide exciting new information about Pluto, its moons and its status in the solar system. “As far as deep-space exploration … that’s what NASA ought to be doing, pushing the envelope for a long-term societal investment,” he said. Not only will the information be worth the investment of about $70 million, it will also be worth the wait, panelists said. By the time New Horizons begins its main mission, it will have been almost a decade since its launch and panelists are eager to see what comes back from Pluto. Grinspoon reminded the audience that working on space probes can be a very long-term project, but that the longer it takes between discoveries, the greater the anticipation for that information. And in keeping with the eclectic theme of the day, he cited rapper Eminem to make his point. “As a famous rapper said, ‘You only get one shot,’” Grinspoon said. 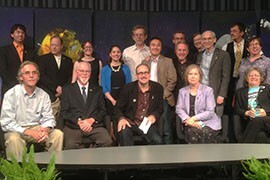 David Grinspoon, center, and other panelists, front row, who met to talk about the space probe New Horizons, which reached Neptune this week and will reach Pluto next summer. 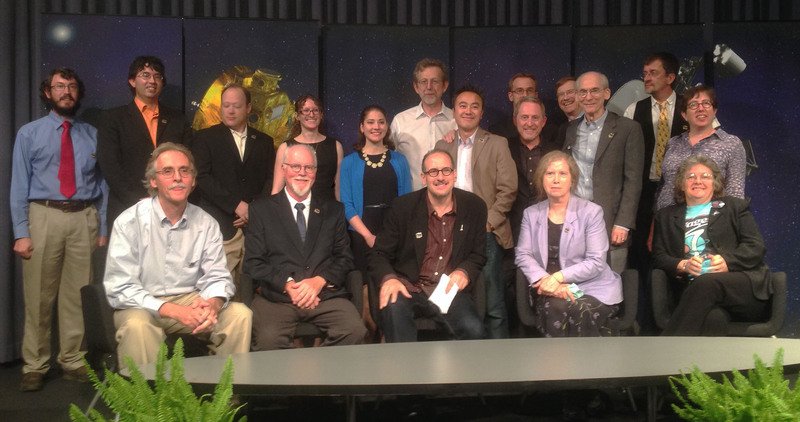 The panelists, and the scientists and students behind them, defended Pluto's claim to planetary status. 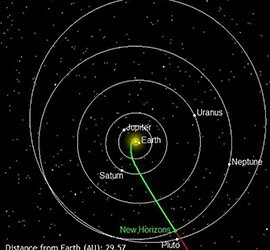 The New Horizons space probe left Earth in 2006 and reached Neptune Monday, on its way to Pluto, which it is expected to reach in July 2015. 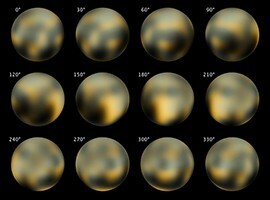 Images of Pluto taken by the Hubble Space Telescope in 2010. The New Horizons probe is scheduled to do a flyby of the dwarf planet next summer.